The AJA FS1-X Frame Synchronizer & Converter with MADI Audio & FRC features a comprehensive array of video and audio inputs/outputs for converting between a wide range of analog and digital signals. It also features a motion adaptive Frame Rate Converter (FRC) for creating high-quality conversions between different frame rate families. It comes in a rugged, 1RU chassis ideal for high-density application and packed machine rooms. 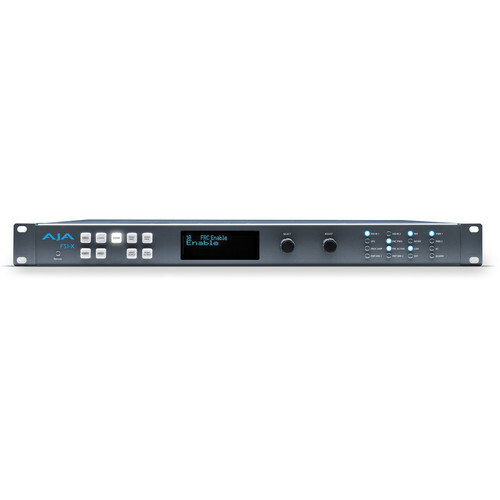 Connections consist of 16-channel AES audio, 8-channel analog audio, 64-channel MADI audio over coax or fiber, GPI and LAN control, optional SDI fiber, 3G-SDI, HDMI, Component, Composite, and Reference with Loop-Through, supporting all broadcast video formats. The front panel features illuminating menu selection buttons, an alphanumeric LCD with status and control information, parameter select and adjust buttons, and activity LEDs displaying settings and conditions. The FS1-X supports redundant power supplies and includes two AC power cords. It is quickly configurable by any computer on the network via a standard web browser, and it can be stacked vertically without limit as long as there's adequate supply of cool air around its vents. The FS1-X with FRC features an optional, factory-installed motion adaptive Frame Rate Converter for creating high-quality conversions between different frame rate families for virtually unlimited international standards support. The MADI standard provides a convenient way to transport huge numbers of audio channels along a single cable, simplifying the cabling demands for broadcasters, mobile trucks, and production. FS1-X supports both fiber and coax 64-channel MADI input and output. An internal 224x224 audio matrix allows full routing of MADI and all audio coming from SDI, fiber, AES, and analog sources. Key conversion features include SD/HD up/down-conversion, SD/SD aspect ratio conversion, HD/HD cross-conversion (720p/1080i), up/down/cross-conversion with the input and converted formats on SD/HD SDI outputs (both synchronized), HD cross-conversion with simultaneous down-converted SDI output, closed caption conversion (CEA-608/CEA-708 standards), and AFD conversion or pass-through (user-selectable). The sidebar keying feature allows incoming video to be converted from SD to HD, but rather than stretching the 4:3 aspect ratio to fit in a 16:9 frame, a second signal is used to fill the sides of the 16:9 frame. This allows channel identification or other imagery to be placed in that area rather than having black bars on either side. The AFD features of the FS1-X ensure that the aspect ratio of the outgoing signal is properly identified for downstream devices. Many functions on FS1-X, such as freezing an input or switching between presets, can be triggered by external GPI's, allowing easy integration into existing systems for seamless and accurate automation. The FS1-X features a comprehensive set of inputs/outputs for converting between a wide range of analog and digital signals. Connections consist of 16-channel AES audio, 8-channel analog audio, 64-channel MADI audio over coax or fiber, GPI and LAN control, optional SDI fiber, 3G-SDI, HDMI, Component, Composite, and Reference with Loop-Through, supporting all broadcast video formats. The FS1-X is network ready and supports SNMP monitoring and web-based remote control. It can be connected to any Ethernet network via its 10/100/1000 Ethernet port, allowing control and configuration of one or more units from any web browser on a connected computer. Configurations can be saved and applied to multiple units, ensuring consistency and quick configuration in large installs. Dual, redundant power supplies ensure the FS1-X remains online even in the event of a power supply failure. Power 100-240 VAC 50/60 Hz (dual, redundant power supplies), 55 W typical; 80 W max., 15 A max. Box Dimensions (LxWxH) 21.575 x 18.819 x 7.717"